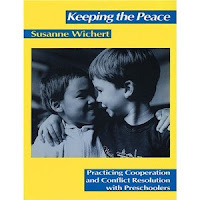 I have been wanting to share with you some of the games mentioned in my Conflict Resolution course textbook, "Keeping the Peace," by Susanne Wichert. This course talked about the importance of having the children to work together to complete tasks to promote cooperation, improve communication, and have fun. We tried a couple of these tasks last year and had a good time. I hope to incorporate some more this year. Some of the tasks may be more for older children, but I thought I would share them all. I am going to share 10 activities at a time, there are quite a few in the book. I am also putting in quick directions. If you don't understand one, or would like more complete instructions, please send me an email and I'll give you more specific information. In this activity a pair of children are creating a picture. One child is drawing and the other child is giving verbal directions. It may take some time to get the children to work together correctly. The drawer may ask questions, but never proceed on their own. The role of the adult is to help the children formulate questions directions. This activity is a bit more difficult than dictated drawing. 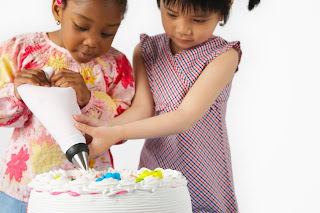 Here one child holds the drawing utensil, while the other child moves the hand of the person holding the drawing utensil. Ms. Wichert states that this activity works better if children have had several opportunities to do Dictated Drawing. Also, she says it is best to do this on a low energy day, and also should be done when the adult is having a "stress-free" day. Here the teacher tells a story of a child that wakes up happy and draw a picture of that child. As the story progresses, the child's day goes downhill. Everytime something "bad" happens a piece of the picture gets torn off. Go through a variety of experiences that may have not been pleasant for the story child, each time ripping of a piece of the drawing. After the story ask the children how they think the child felt and if they ever felt that way. Ask them if they can think of ways to make the child feel better. Everytime they give an idea, tape a piece of the picture back on. Do this until the picture is back together. For this activity you will need one box of raisins per child, and one length of string, about 20 feet, per child. Tie a piece of string to a box of raisins. Hide a box of raisins somewhere in the room. Do this with the next box of raisins and run the string around trying to tangle it. Hide all the boxes and run all the strings tangling them. Each child gets a piece of string and they must untangle the string and get the box of raisins. Here is one we have done a few time. You will need a ball of string or yarn for this activity. Have the children sit in a circle--not too big. Let one child start. Have them hold the end of the string in one hand and the ball of string in the other hand. They then roll the ball to another child. That child holds onto their piece of string and rolls the ball to another. And so on, and so on, until you have completed a spider web. You may have to remind the children to keep holding their piece of string--they like to drop it. Ms. Wichert states she has found a heavier string works better than a thin one. The children sit in a group. You will have one child that will be the sculptor, and one who will become the sculpture. It is sometime best if the teacher is the first sculptor and has a child willing to help them show the other children. Tell the child she needs to freeze in the position which you place her. (A child always has the right to not participate, or tell you when they are uncomfortable.) Gently move the children's arms and legs into different positions without using verbal direction. When you have finished, indicate this to the group and encourage them to applaud your efforts. The children may continue sculpting each other as long as their is interest. This activity is a bit like dictated drawing, but you will be using paper cut into shapes and strips, and some glue. Children work in teams of two. One child verbally tells another child which piece to use and where to glue in on the paper. The rule is that the child who is gluing must do what they are told to do by the other child. When one design is finished, the children trade rolls. The object of this activity is to get children to articulate tings they like about themselves and that are special to them. 1. Draw yourself. What is the thing you like best about yourself? 2. Draw the other people in your family. What do you like best about them? 3. Draw your house or apartment. 4. Draw the room where you sleep. After the children draw their pictures, write on each page what they have to say about it. The last project for today is: Lone Star (Up to 10 children) I did this with 12. If you would like to see how this project is done, click here. I have included 10 activities in this post. There are quite a few more. I'll be sure to add more later. Again, if you would like specific information about an activity, please feel free to email me.